The Ministry of Housing & Urban Affairs has approved the construction of another 3,10,597 more affordable houses for the benefit of urban poor under Pradhan Mantri Awas Yojana (Urban). The approval was given in the 41st meeting of the Central Sanctioning and Monitoring Committee held here today.The cumulative number of houses sanctioned under PMAY(U) now is 68,54,126. Uttar Pradesh has been sanctioned 1,08,135 houses while the sanction for Karnataka is 1,05,502 affordable houses. 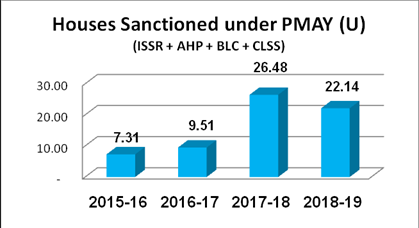 The number of houses sanctioned for Andhra Pradesh is 57,433, while Odishahas been sanctioned 21,894 houses and Gujarat17,633 houses. A total of 864 projects with a project cost of Rs 14,662 crore with central assistance of Rs 4,658 crore has been approved in the meeting held under the Chairmanship of Shri Durga Shankar Mishra, Secretary, Ministry of Housing and Urban Affairs. The approvals under the Beneficiary led construction(BLC) vertical is 1,91,556 while it is 1,18,941 under Affordable Housing in Partnership (AHP)vertical.